Unreliable narrators are some of my favorite ways to read books and Liza and Beth were no exception to that rule. It was really hard for me to decide which characters head I wanted to be in because I enjoyed spending my time in this book wondering what was real and what wasn’t. And I got to do that with two different people, even better! 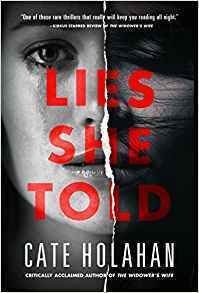 I feel like Lies She Told is a fantastic example of how thrillers should be told. Quick. To the point. Detailed but not too detailed. Page turning. But is it ONLY a story or much more? The coolest part about was how Beth’s thoughts would creep into Liza’s during real time. It felt much more connected, story wise, when that happened. Like Liza had connected with Beth in a way that needed to be done and helped provide readers with a sense of direction. Even though most of the things in the book can be predicted, I still loved seeing the way that both of the stories within the book unfolded. Seeing it all unravel was that much more exciting to me. The writing was captivating and the characters were all going in different directions and I actually really enjoyed that. The book isn’t long at all which means it’s a pretty quick paced story but as a reader, my personal preference is for books to be like that. Right to the point and no beating around the bushes (hehe if you’ve read this you’ll appreciate the pun). Now, if you’ll excuse me I need to go scope out this authors other works.